After the last two losses, the Nets looked to get a win against Philadelphia at home in the Barclays Center. The Nets are now 2-4 since LeVert’s Injury, and they know the importance of a win. As the first quarter came underway, D’Angelo Russell led the Nets to a 7 point lead, as he went 5/7 from the floor, with 11 points and 4 assists to finish the 1st quarter. As the game progressed Spencer Dinwiddie exploded off the bench as the Nets went on a 10-0 run late in the 2nd; the Sixers trailed by 14 (68-54). The offensive barrage continued from Nets Guards Russell and Dinwiddie. Brooklyn scored a season-high 102 points through 3 quarters. D’Angelo Russell added 29 points, and Spencer Dinwiddie gave 22 points & 5 assists as the Nets closed the 3rd. 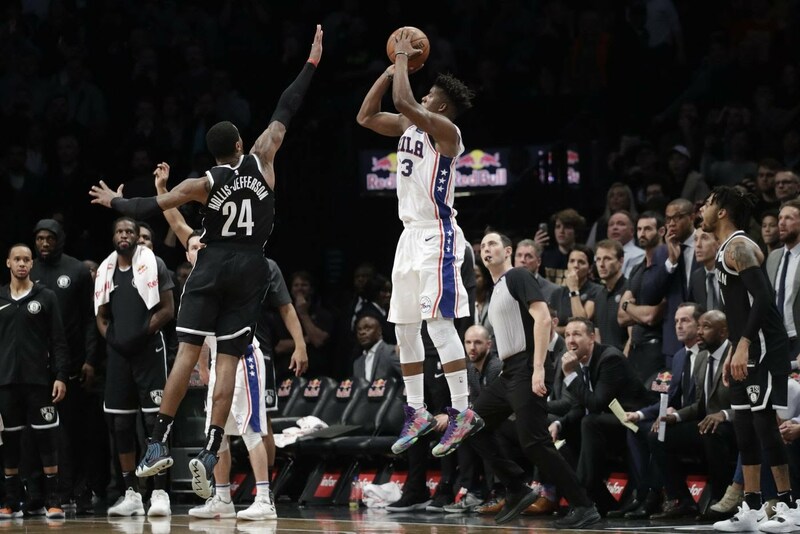 As the 4th quarter began, the Nets sloppy play ensued; the 76ers closed the gap on the Nets lead and Brooklyn lost control. The Sixers outscored the Nets by 15 in the 4th. With the clock winding down, and Brooklyn looking to squeeze out a win, Jimmy Butler drains a 3 with 2.3 seconds on the clock giving the Sixers the lead and the win. Despite the Nets excellent play through the first 3 quarters, their lack of aggression and lack of ability to close the game would cost them this loss. Philidelphia defeats the Nets 127-125. Season Highs! !- Both Spencer Dinwiddie and D’Angelo Russell scored season highs. Russell finished with 38 points, 8 rebounds, and 8 assists on 16-28 shooting. Dinwiddie garnerd a high of his own, with 31 points and 5 assists off the bench. Crabbe Goes Scoreless! !- Allen Crabbe had a horrible game. He finished the night with 0 points, going 0/4 from the floor. Butler Does it Again! !- Butler sinks another shot from the right wing to seal a win, reminiscent of his game winning shot against Charlotte. Butler finished with 34 points and 12 rebounds. The Nets are now 8-13 for the season and have lost their 3rd game in a row. While they are still missing Caris LeVert’s offense they will have to continue to push forward. They have a few days off, and their next game will be at home as they host the Utah Jazz Wednesday evening.